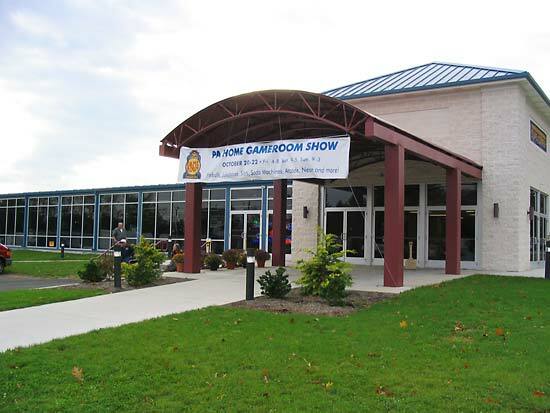 Location: Carlisle Expo Center, Carlisle, PA, USA. 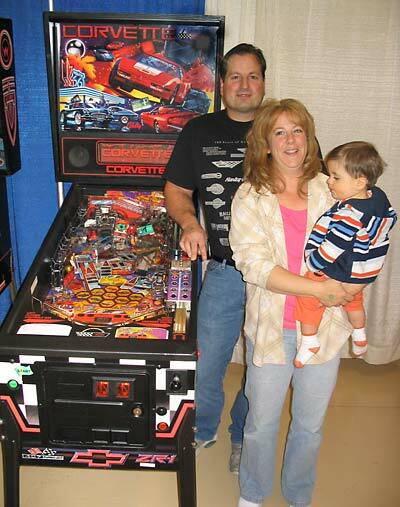 Welcome to our coverage of the PA Home Gameroom Show held each year in Carlisle, Pennsylvania. The venue is a large brightly-lit single storey hall and a lobby incorporating a ticket office. The hall contains the restrooms and also a food concession selling hot dogs, burgers, lattice fries, sodas and coffee. It was in the lobby where the grand prize in the prize draw was displayed. 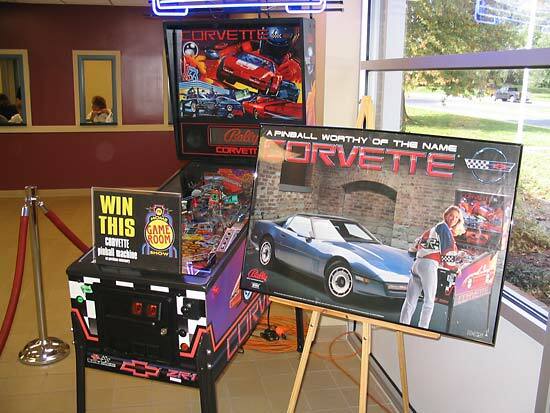 This lovely Corvette game would go to the winner of the draw which is held on Sunday. 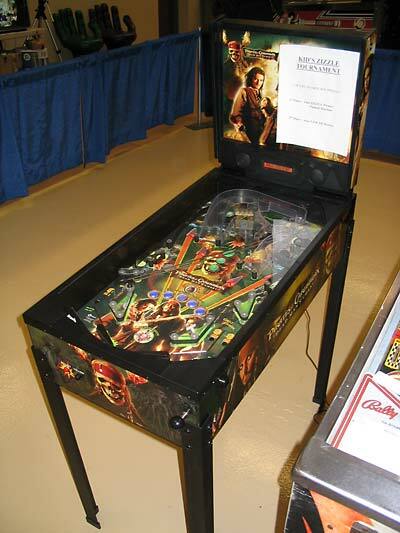 The generous ambient lighting makes it easy to see all the goods on sale but the side effect is to produce lots of glare on the pinball playfields and also to make the ambience a little sterile. 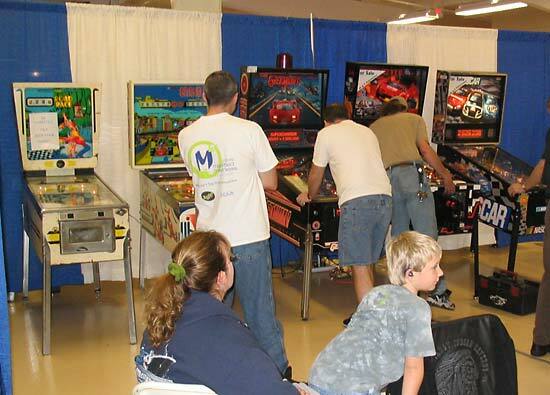 The show covers three days - Friday, Saturday & Sunday - and unlike most of the other events we cover, it's not just about pinball. 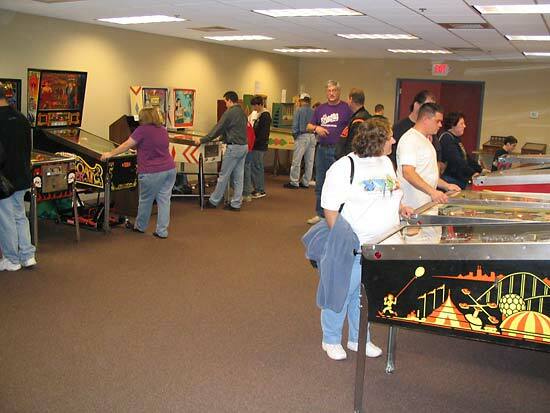 This is a memorabilia, gameroom and collectibles show with pinball making up only about 25% of the total mix. 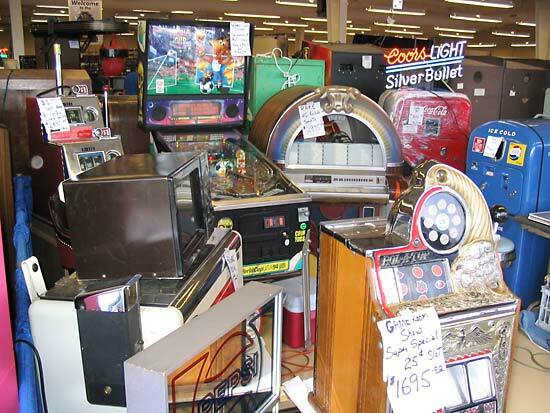 There are jukeboxes, slots, video games, shooting games, neons, bar equipment, gumballs, traffic lights, in fact just about anything home gameroom related. It's quite astonishing to see the range of items available here. Prices are set to sell and there are some nice deals available if you're prepared to haggle. There was also this interesting reduced-size Kiss game brought to the show by Tom Manely. Built as a prop for a movie to be played by a midget, it was never used and is now owned by Tom's company Flashback Classic Coin-Ops. 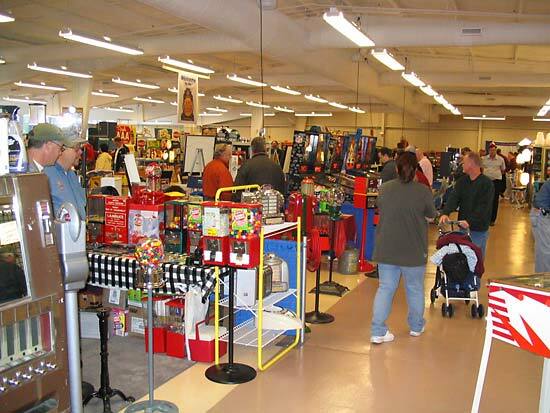 Saturday is by far the busier of the weekend days but even saying that, the size of the hall means the aisles are rarely crowded, even with the jukeboxes, manekins and gumballs busting out of the booths into the walkways. But that's not to say there aren't plenty of pinball games here too. Actually there are 95 including those in a special room set aside just for pinball and bingo games. The main tournament was played on motoring-themed games from the '60s, '70s, '80s, '90s and 2000s. They were Road Race, Grand Prix (Wms), High Speed 2 - The Getaway, Corvette and NASCAR. Entries cost $5 each or 3 for $10 and the aim was to get as high a ranking on as many machines as possible in order to qualify for the finals on Sunday. Multiple entries were allowed on the main tournament and on the mini-tournaments also. The first of the mini-tournaments was reverse-hand play on a Nitro Groundshaker running across Friday and Saturday with the highest scorer at the end of Saturday winning 50% of the cash pot. By mid-afternoon on Saturday the leader was Zach Sharpe with 138,950 points - a score which proved to be good enough to take first place. There was also a high score mini-tournament running on the Zizzle Pirates Of The Caribbean for kids. 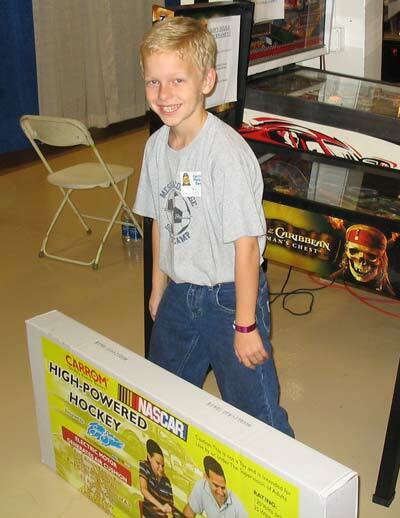 The winner would take home the machine as their prize while the runner up would get NASCAR hockey game. The winner of the Kids Tournament was Cam Ross whose score of 165,175,000 was enough to beat second place Elijah Plasterer's 132,200,000. Sunday's session began at 9am and was scheduled to finish at 3pm to allow exhibitors time to tear down and pack everything away ready for the drive home. But with six hours of the show still to go, everything was back in full swing very quickly. Take a look. Three Minute Tour - see the show for yourself with our exclusive tour round the show hall in just three minutes. The main tournament qualification round continued until midday with players vying to grab one of those top seven qualifying positions. 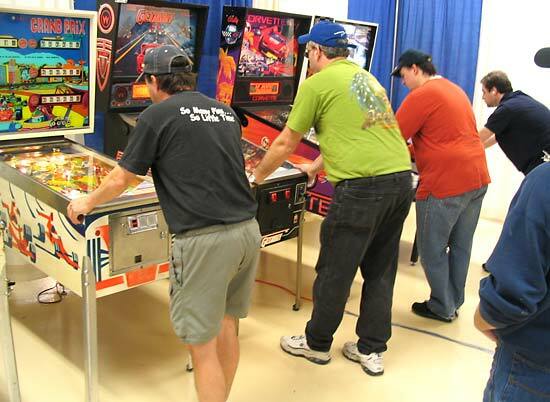 The finals were played on the same machines with the best of three games going through to the next round. The higher ranked player had the choice of which game to play first, the lower ranked could choose to play first or second. After two rounds, the finalists for the Professional division were Zach Sharpe and Trent Augenstein. 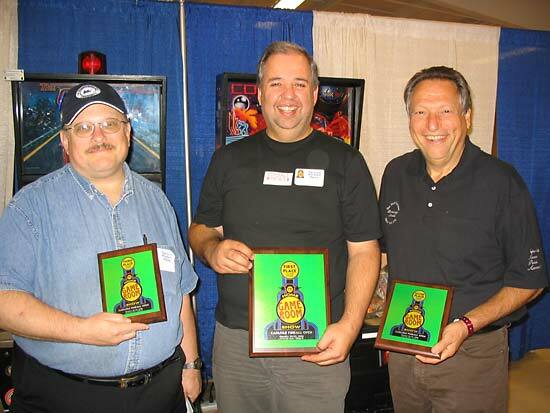 In the Amateur division, the finalists were Steve Epstein and Martin Ayub. 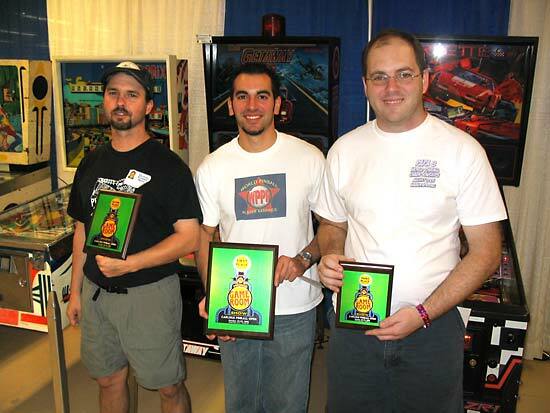 The Amateur division finished first with Martin winning on Grand Prix, Steve winning on Road Race and it all came down to the last game on NASCAR which Martin won to claim the $200 prize and a plaque. In the professional division final, Trent won the first game on Corvette, Zach won the second on NASCAR and the third and deciding game was played on a Williams Grand Prix. On the very last ball, a machine fault occurred prematurely ending Zach's turn, so he got to play another ball and add that to his score. He beat the required score and so won the Professional Division and a $600 prize. 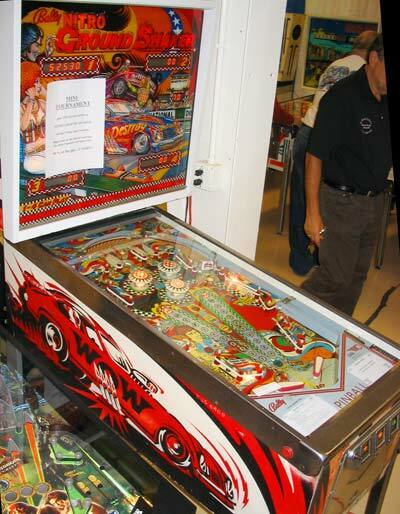 As the tournaments were drawing to a close, the draw was taking place for the Corvette pinball machine. Tickets were included with show entry and also when additional entries were purchased for the tournaments. 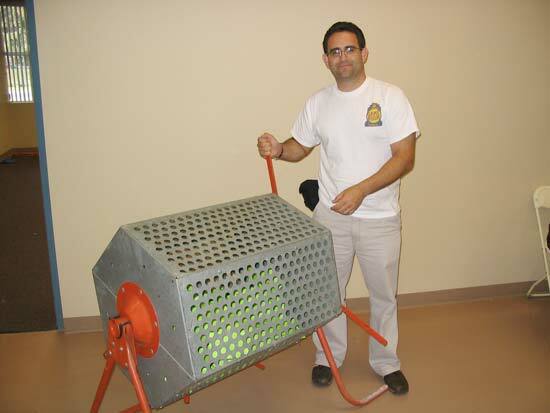 The lucky winner was drawn and it was Chris Benedict from Washington, New Jersey who was taking the game home with him. All of which brings the PA Home Gameroom Show to a close. This is the third show and its new location seems just about the right size. The Expo centre is a new facility with reasonable catering and plenty of space to move about. Access is good from the free car park and there is a general good vibe about the show. 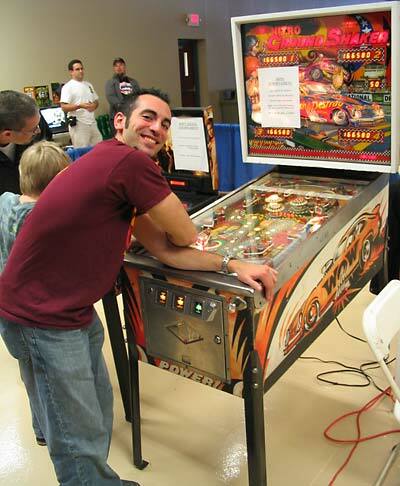 The addition of the pinball tournament run by Zach Sharpe, Steve Epstein and Bowen Kerins provided some much needed competition over the weekend. Everything appeared to run smoothly and the tournaments were well supported by the players. Hopefully the show can continue in this form. 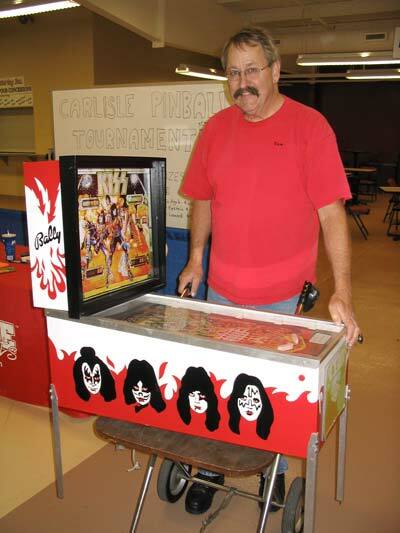 Organiser Jimmy Rosen told Pinball News how the previous show had very nearly been the last ever, but the help from the Carlisle staff convinced him to hold another and this year's show was much more sustainable. 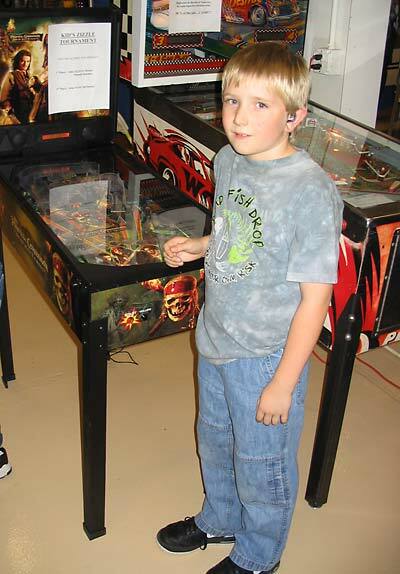 So hopefully there will be another PA Home Gameroom show in 2007.